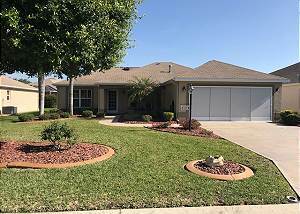 The Villages, Florida United States - Village of Glenbrook with gas golf cart! | RE/MAX PREMIER REALTY Inc. This beautiful two bedroom/two bath Ranch home is conviently located in the Village of Glenbook with a gas golf cart for leisurely enjoying The Villages lifestyle. There is a spacious open floor plan that allows you to prepare and serve meals in the fully equipped kitchen, while never missing any conversations. In addition to the generous seating in the living room there is also a great Florida room with an additional futon for sitting or sleeping space. Enjoy your morning coffee on the nice screened lanai while planning your day or finish your day sipping a cocktail while tending to dinner on the gas grill. Centrally located between Spanish Springs and Sumter Landing town squares. Very close to shopping, dining, 3 championship/13 executive golf courses, 3 pools, a library, polo fields and even a regional recreation center! A guest from New Bern, NC United States recommends this vacation rental.